The Epson L210 is an all-in-one with integrated ink system, ideal for home offices and students looking to print, scan and copy at an ultra-low cost. Featuring Micro Piezo printhead technology and Epson genuine ink, you can easily print for less without compromising on quality. The L210's 12 month (or 15,000 page) warranty and service support, provides peace of mind and help if you need it. The purpose-built ink tank is fully integrated into the printer, so you can enjoy reliable colour printing without the mess or hassle often associated with non-genuine refills and third-party ink tank systems. The Epson-genuine ink bottles make it easy to refill the ink tank with their clear labelling and drip-free nozzle. The L210 is quick to set-up and use compared to third-party ink tank systems: simply fill with the ink supplied, turn the printer on and prime the ink system. Now the L210 is ready to print. 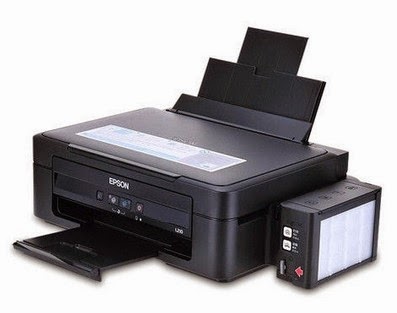 The L210 offers affordable printing and a low-cost per-print. Each set of high-volume ink bottles can print up to 4,000 pages in black and 6,500 pages in colour*1, delivering an ultra-low cost per page for both black and colour printing. The L210 has a 12 percent smaller footprint than previous models*2, and complements any work environment.